Home > Updates > News > Heavy joining from Utharandhra Area. 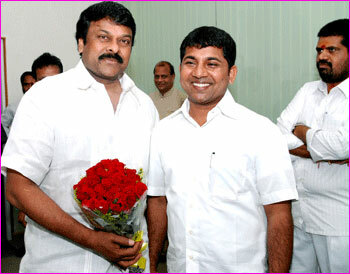 Today thousands of Megastar Chiranjeevi supporters, fans and leaders joined prajaaraajyam party. overwhelmed crowd responded in a positive note with chiranjeevi short speech at Prajaaraajyam Party office. Megabrother Nagababu also attended the joining ceremony. The joining today includes, Mr Ajay Naidu, owner of the Naidu Motors, Gurana Ayyalu of Vizianagaram district, Mr Nanda Gopal, industrialist from Anakapalli, Mr Jagadam Sudhakar from Nalgonda, ex MLA Dantuluri Dileep Kumar from Anakapalli, Mr J K Raju, Panchakalyani Ramesh from Vizag, Nimmidala Sanyasi Naidu from Anakapalli, Nanaani and Nivas Verma from Yalamanchali, Mr Srinivas, Avanthi group of educational institutions and also cine producer T Ramesh Naidu joined the party.